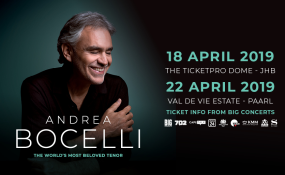 Cape Town — One of the world's biggest classical stars Andrea Bocelli, will perform in South Africa on two tour dates in 2019. Andrea Bocelli has recorded 15 solo studio albums of both pop and classical music. For his latest release Si, the prolific artist teamed up with some of the hottest musical stars on the planet - reuniting with his friend Ed Sheeran after their chart-topping Perfect Symphony on a brand new song called Amo Soltanto Te (written by Ed with lyrics by Tiziano Ferro) and joining with pop sensation Dua Lipa on the single If Only . At the centre of the new record is a spine-tingling duet between father-and-son, as 20 year-old Matteo Bocelli steps into the limelight to duet with Andrea on Fall On Me - a beautifully poignant song which reflects the bond between parent and child. Andrea explains how his voice compares with Matteo's: "Technically they are very different, but there is one thing that makes them most similar: The attitude. That characteristic way of expressing yourself through your voice. This makes Matteo and I very similar. But that is something that you cannot learn, that cannot be taught. That is something you are born with." Andrea is proud to return to South Africa where he will be performing with a full 140-piece symphony orchestra and choir. In Johannesburg, he will perform with the Johannesburg Festival Orchestra and the Symphony Choir of Johannesburg and in Cape Town with the Cape Town Philharmonic Orchestra and Choir. The concert will be split into 2 parts. For the first part, fans will get to experience Andrea Bocelli perform some of the most famous opera arias. The second part will be dedicated to his most popular hit and crossover songs for a once in a lifetime evening. Matteo Bocelli will also be joining his father to perform the duet Fall On Me . Halaal / Kosher meals available on request - contact Ticketpro Dome at 011 794 5800. Prime seated ticket in Block B (Rows 4-9), Block C (Rows 4 - 11) and Block D (Rows 4-9).